Seeking Partner Pharmacies: Why be a part of the project? Your patients’ adherence will improve! In the pilot phase, the average medication possession ratio (MPR) had significantly improved after the label change in three commonly prescribed categories. Your pharmacy will be publicly recognized for being on the leading edge of best pharmacy practices. Your patients will be more satisfied, healthier and safer because evidence shows that patient-centered labels are easier to read and understand. What is involved for your pharmacy? There is very little cost to joining the project other than the staff time necessary to redesign the labels. It may be desirable to purchase new label stock and WHL has some funding available to help reduce this expense. Additionally, prior pharmacy partners are available to answer questions you may have. Download the flyer that provides more information about the project. 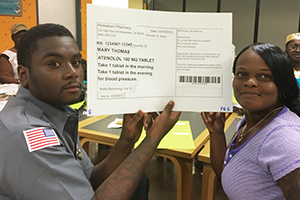 In January 2018, Wisconsin Health Literacy began a three-year project to greatly expand the earlier pilot phase to implement new prescription medication labels in Wisconsin. This project is also funded through the Healthier Wisconsin Partnership Program of the Advancing a Healthier Wisconsin Endowment, stewarded by the Medical College of Wisconsin and will be completed in December 2020. The project will once again focus on systems change with the successful implementation of new labels in 15-21% additional pharmacies across the state of Wisconsin. As Wisconsin pharmacies voluntarily adopt easier-to-read labels, Wisconsin residents receiving prescription medications will experience better medication adherence and improved satisfaction. Collaborate with an additional 15-21% of pharmacies across the state of Wisconsin to adopt new labels using United States Pharmacopeia guidelines. Increase awareness of new labels through communication and outreach activities. Academic Advisory Group: this group consists of experts who have engaged in research surrounding patient-centered labels and will share their knowledge to help move the project forward. Sig Improvement Task Force: In the pilot phase there was a strong desire by pharmacies to improve the sig, but it was beyond the scope of that project due to its complexity. In this phase, key stakeholders, including Epic representatives, will develop recommendations to organizations to improve their directions for use to meet the USP guidelines. Identify reliable communication translation resources for pharmacies. Evaluate medication adherence through insurance claims databases and pharmacy statistics. Create a Label Champions group and other resources to assist pharmacies in implementing new labels after the completion of the project. Pharmacists from the pilot phase and this phase will participate to help new pharmacies. 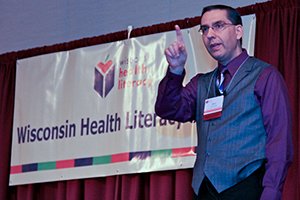 Wisconsin Health Literacy, a division of Wisconsin Literacy, Inc. will again lead the project in conjunction with Medical College of Wisconsin academic partner Kenneth D. Schellhase, MD, MA, MPH, Professor, Family and Community Medicine. 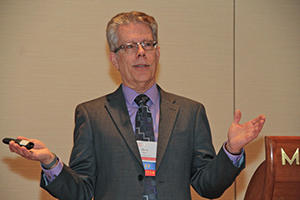 In addition to participating pharmacies, collaboration is also being offered by: United States Pharmacopeia, Pharmacy Society of Wisconsin, UW-Madison School and Medical College of Wisconsin Schools of Pharmacy, Epic Systems, Wisconsin Academy of Family Physicians, and the Wisconsin Network for Research Support. For more information or if you are interested in being a part of this project, contact Kari LaScala, Project Manager: kari@wisconsinliteracy.org.